The main mountain range in the state is the Sierra Madre Occidental reaching a maximum altitude of 10,826 ft (3,300 m) known as Cerro Mohinora. 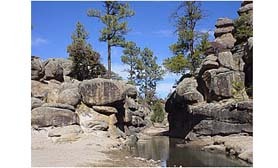 Mountains make up for one third of the state’s surface area which includes large coniferous forests. 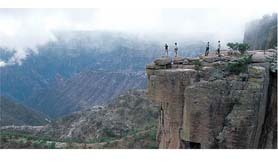 The climate in the mountainous regions varies Chihuahua has more forests than any other state in Mexico, making the area a bountiful source of wood; the mountainous areas are rich in minerals central to Mexico’s mining industry. Rainfall and temperature in the mountainous areas depends on the elevation. Unusually for Mexico, between the months of November and March snow storms are possible in the lower elevations and are frequent in the higher elevations. There are several watersheds located in the Sierra Madre Occidental all of the water that flows through the state; most of the rivers finally pour into the Rio Grande. Temperatures in some canyons in the state reach over 100°F in the summer while the same areas rarely drop below 32°F in the winter. Many microclimates are found in the heart of the Sierra Madre Occidental in the state that could be considered tropical and there have been wild tropical plants found in some canyons. 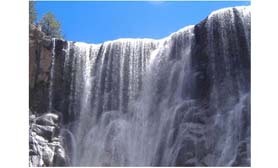 Basaseachic Falls and Piedra Volada. 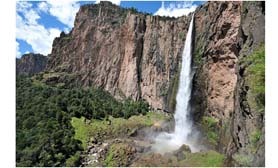 Furthermore, there are two national parks found in the mountainous area of the state: Cumbres de Majalca National Park and Basaseachic Falls National Park, making the states very attractive for national and foreign tourism. 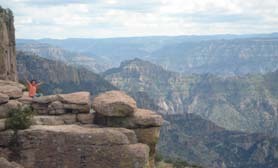 The plains at the foot of the Sierra Madre Occidental is an elongated mesa known as Altiplanicie Mexicana that exhibits a steppe climate and serves as a transition zone from the mountain climate in the western part of the state to the desert climate in the eastern side of the state.